The hiatus between the conclusion of spring practice, last seasons pratfall and next August is here. We have time, then, to reminisce, ruminate and regurgitate past gridiron games, both great, sad and unforgettable. Upon reflection, here are TEN of mine, indelibly engraved in my gray matter. 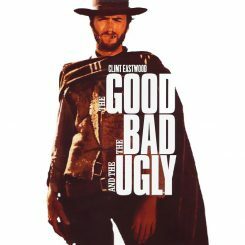 They could be called The Good, the Bad and the Ugly circa the Clint Eastwood spaghetti western of same name. Like a broken record, played over and over again, they fill the interregnum between football seasons. A great movie AND a great way to organize Duck memories. 1. 1994: Of course, Kenny Wheaton’s pick six and the half-baked attempt by the dawgs’ QB to tackle him at mid-field … priceless. It was the seminal moment in modern Ducks’ football history, as they would go on to play in the Rose Bowl for the first time in decades. One of the best memories of all time. 2. 1988: Terry Obee’s end around on 4th down to score the game winner over the dreaded Mutts late in the game. Gutsy call, high risk/reward … but ultimately glorious. 3. 12 In a Row: For a dozen years, we put a choke chain on Canis Domesticus, while they of course were crying and whining about their futility against our Ducks. After another loss in Seattle, I heard one Husky fan exclaim, “I know for a fact Oregon has a deep cover mole on our staff, telling them our every play. How else could they dominate us like this?” Husky paranoia to the max—sublime! 4. Winning nine of the last ten against the Beavs, keeping little brother where he belongs—behind, insignificant and futile. After a slight hiccup in 2016, we handed them a 69-10 drubbing last year … normal order restored. 5. Double Prophylactic Breakage (2001, 2009): In 2001, Seigel’s FG at the end of the game won it for the Ducks 24-22 over “U$C.” On Halloween in 2009, we spooked the contraceptives at Autzen again. Pete Carroll could see the writing on the wall after a 47-20 shellacking! 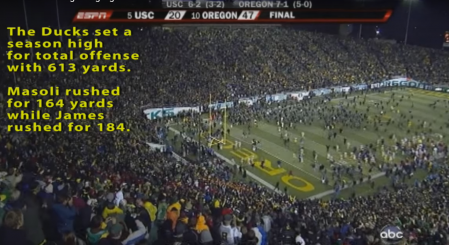 Oregon dominated USC in 2009 at Autzen. 7. 1975 San Jose St/Oregon: The Ducks lose 5-0. In the second half, the Ducks drove inside the 5-yard line, took four cracks at the goal line … and turned it over on downs at the 3! Said William Boyd, President of UO, after the game: “I’d rather be whipped in public than endure that again.” Me too. You just knew it was gonna be a long season after that. Dreadful. 8. 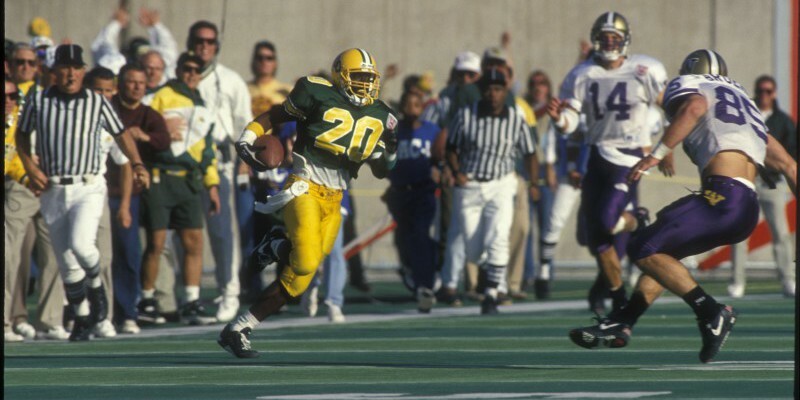 1984 WSU/ Oregon: A bad memory for two reasons. Firstly, it’s a 50-41 loss for the Ducks. 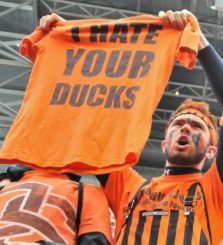 On top of that, a Duck fan decides to have massive heart attack at kick-off and falls into my brother and I from behind. We administer CPR for 5 minutes before EMS arrives, with people cheering us on, not the game. He’s DOA, just like the Duck defense, as Reuben Mayes runs over, around and through us for an NCAA record 347 yards, still a Pac-12 record today. Death haunts us all, especially our defense that day. 9. 1969, 1971 Civil War: In ’69, Beavers coach Dee Andros is pelted with eggs on the chest and leg as he enters Autzen. He doesn’t bat an eye, though, and instead mauls us 10-7. Egg on our face! In ’71, a 30-29 loss, a Beaver fan three seats over projectile vomits beer and nachos on Duck fans below him. The smell was awful, just like the game. Bobby Moore (Amad Rashad) never scores against the Beavs during his great career. It made me want to barf. The Black Bandits of Benton County own us like a rented goalie again. Completely unpalatable. 10. 1983 Toilet bowl: OSU and UO tie 0-0 in a game with 11 turnovers! Playing in monsoon conditions, Ladaria Johnson (#9) is sloshing for the winning score deep in enemy territory with minutes left, when he loses the slippery pigskin. The Beavs, of course, recover. I stayed till the bitter end, swamped, soaked and stupid. We witnessed first-hand the drenched, doused Duck demise—worse than any defeat. Just a stupid excuse for a football game. Flush it away! Jeff Maehl ties it up against Auburn. Glendale: Ticket sellers are hawking tickets outside the stadium before the game. I see an Auburn guy come up and say, “I’d like 4.” “That’ll be 4 grand sir,” the scalper says. This Tiger fan promptly pulls forty Benjamins out of his oversized wallet and forks them over. He calmly turns to me and says, “Can’t never git no season tickets, so I’m travel’n with friends to see this here game. Credit cards, they’s evil.” As was the Tiger defense, for his’n, over us’n. But we were still so close. Arlington: I’m sitting beside a father and two sons. They flew in on a private jet that morning. “My boys are 10 and 12 and just love your Ducks. Kinda a treat for them (no kidding). Our Longhorns are bad, we’re pulling for you folks.” Wish he’d pulled harder, cause the Bucks were too big, talented and well-coached for us! 0-8 Lifetime against the Buckeyes. Just once, please? 2. Beavers: “I hit Joey (on his bike)!” and ”Pluck the Ducks!” Some pent up animus from little bro! There you have it. Some of my most magnificent and morbid moments from Duck football. They stick like glue or a soaked, sweaty shirt on a hot muggy day. Here’s to hoping for even more great memories for Oregon football this year. Are you willing to rustle up memories that stand out for you? Comment below. “Sharing is caring” among faithful Duck fans!